In this first episodic adventure of Virtual Cop, known as "Good Cop, Bad Cop," you assume the role of John Copeland, played by Jeff Tatum. The interactive movie combines full-motion video sequences with comic book art and advances through a series of decision-making choices that help determine the outcome. Not only is the storyline of the premier episode affected by your choices, but the opening of subsequent releases is determined as well. In the virtual world of Metro, Lt. Jo Vaughn, played by actress Elizabeth Saltarrelli, is the team leader who helps direct Copeland's action through her "virtual chamber" where files, blueprints, artifacts, and interviews are available. As the expendable virtual cop Copeland, you follow the trail of biological software smugglers with feedback and input from Lt. Vaughn. Unfortunately, your path crosses that of a deadly assassin from your past, Viktor (Bruce Bohne), who feels it necessary to eliminate you based on what you've seen and discovered. It's followed by Episode 2: The Angel Returns where John Copeland dons the mantle of his dark past. 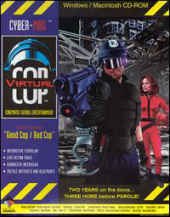 Amidst a disastrous mission, virtual officer John Copeland finds himself "off the net," free and clear of his virtual link to the cops. Before him stands arch villain Viktor, a deadly wetware extractor no one has seen and lived to tell about. Faced with execution by Viktor, Copeland betrays his team leader Jo, and goes on the run, donning his dark and secret alias, "Angel." Trusting that Jo's feelings for him will restrain her from throwing his termination switch. Copeland sets a death trap for Viktor. Capturing the extractor's original target, Barth, who is enhanced with experimental military wetware, Copeland confronts Viktor as well as his own dark past. Episode 3: Back In Blue.